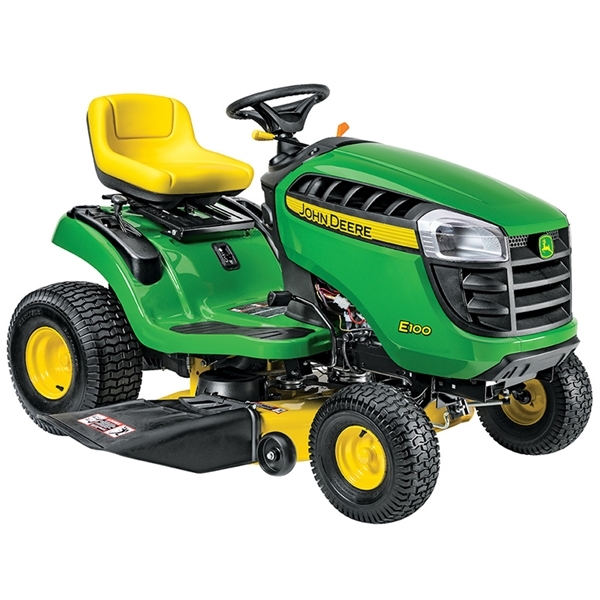 The E100 Lawn Tractor,with it's automatic, continuously variable transmission (CVT) and powerful overhead valve engine is a great value Lawn Tractor. It has a 42-in. mower deck that is ready to side discharge,mulch or catch. 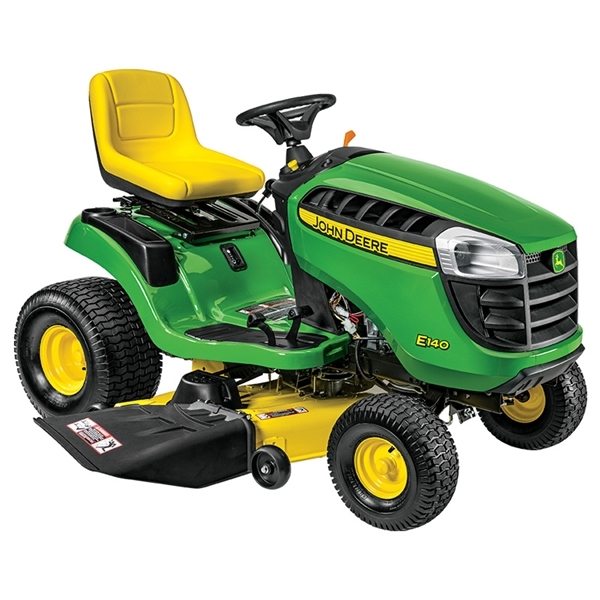 The E110 Lawn Tractor has the added advantage of a two pedal foot operated hydrostatic transmission and an hour meter with a 19 hp exclusive John Deere engine. 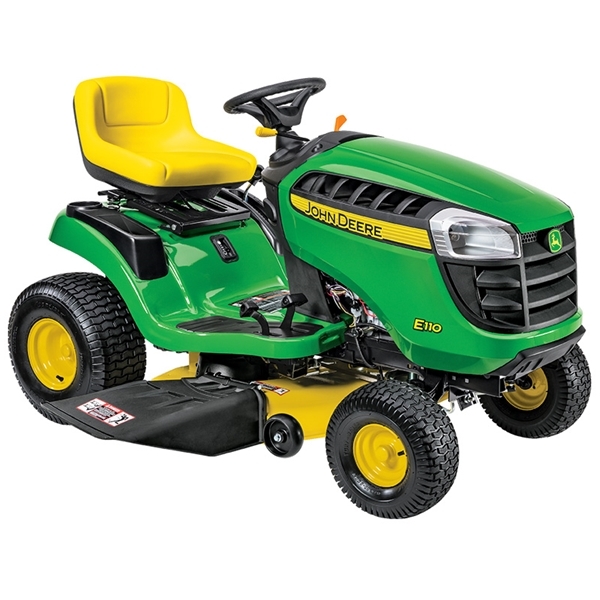 The E120 Lawn Tractor offers a 42 In. Edge (TM) Cutting System complete with a wash out port, a V Twin 20hp engine with the new John Deere easy change oil system makes changing the engine oil easy,quick and clean. 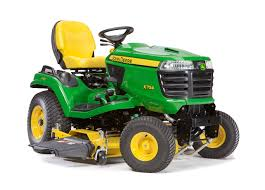 This top of the Range 100 series Tractor offers a V-Twin 22hp John Deere exclusive engine, a double bar bumper, high back seat and fender flares. 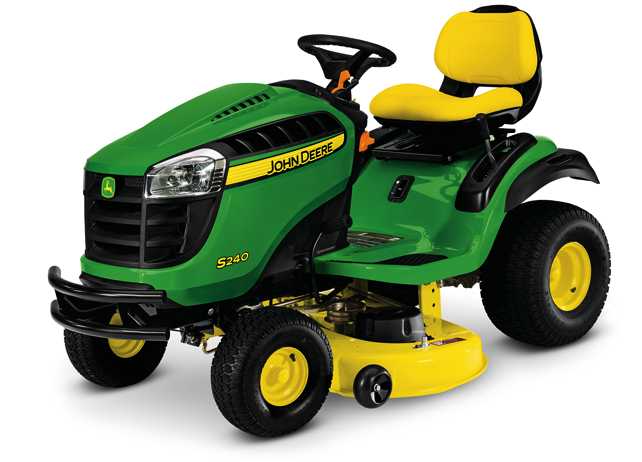 This 48-inch, 22-hp, twin-cylinder John Deere lawn tractor has a foot operated hydrostatic drive, electric blade engagement, an hour meter, and a high-back seat. 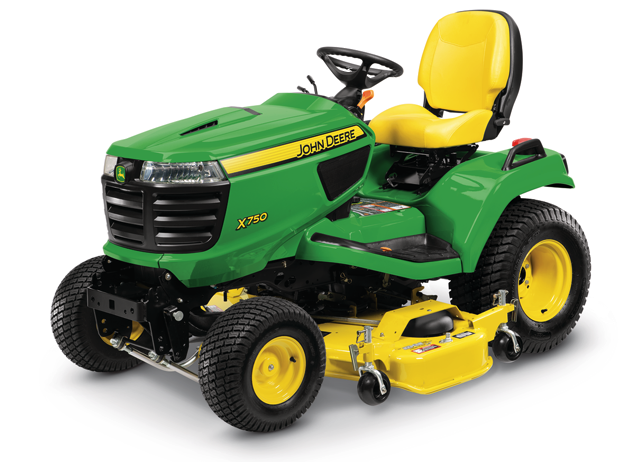 The new S240 Sport Lawn Tractor with two-pedal forward/reverse foot controls, precision cut, premium quality 42-inch edge cutting system and a cast iron front axle for durability, the cut of your lawn will be the envy of your neighborhood. 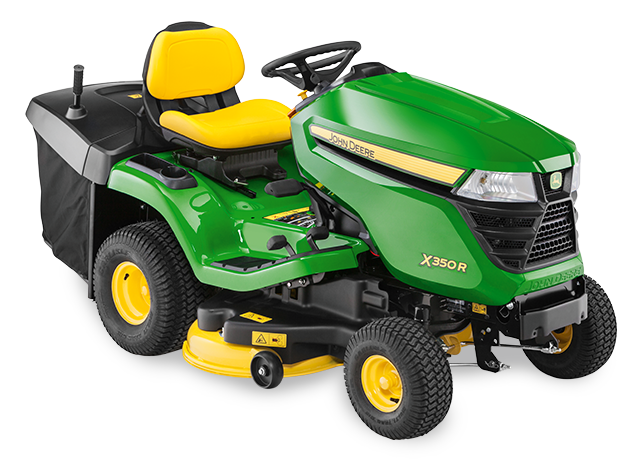 This lawn tractor has all the best qualities of the 100 Series Lawn Tractors like a fully welded frame, cast-iron front axle and fully enclosed UV resistant bonnet, but with a 300-litre rear catcher and optional side discharge chute makes the X115R a very versitile machine. 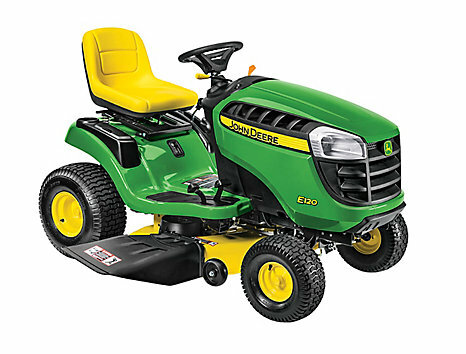 This lawn tractor has all the best qualities of the 100 Series machines like a fully welded frame, cast-iron front axle and fully enclosed UV resistant bonnet, but in a specialist collection configuration. The Select Series X350R Rear-Discharge Tractor comes with a smooth running V-twin iTorque power system, automatic transmission with easy to use Twin Touch controls, 42-inch (107cm) rear discharge, rear collect mower deck and 8.5-bu ( 300 L) hopper. 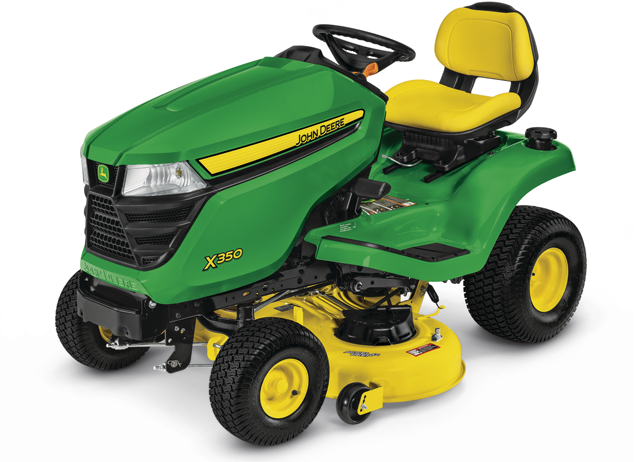 The X350 Select Series Lawn Tractor is a premium product at an attractive price. It comes with a smooth running V-Twin iTorque power system and an easy to use twin touch hydrastatic transmission. This model has either the 42-in. or 48-in. Accel Deep Mower Deck option. 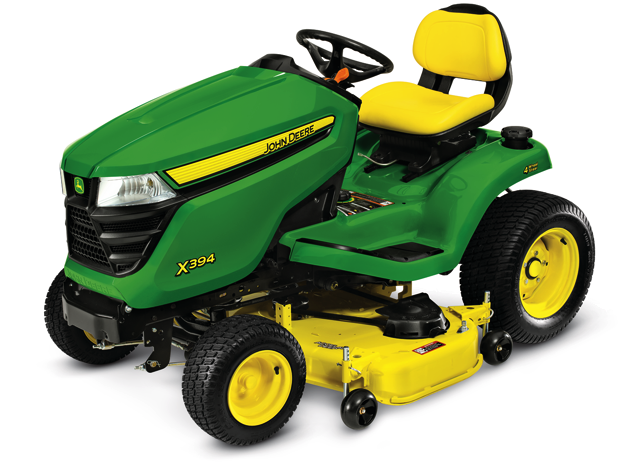 The X354 Lawn Tractor has 4-wheel steering for superb maneuverability and tight trimming with it's 42-in. Edge Xtra cutting system. 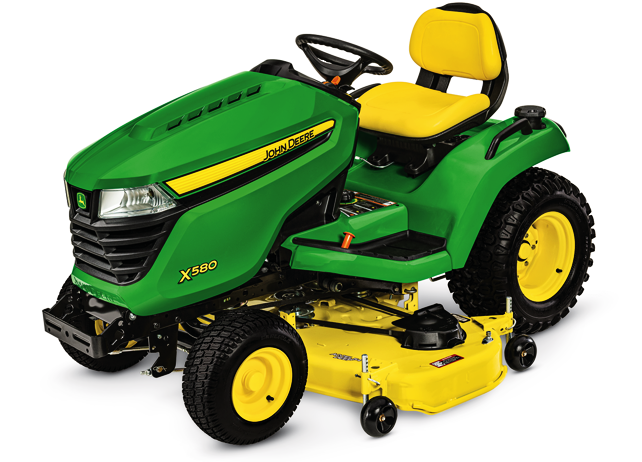 The X370 Select series mower offers added operator comfort with a hydraulic lift control lever near the steering wheel for quick, easy and precise fingertip control of equipment and hydraulic power steering providing effortless, automotive like control. 48 inch or 54 inch. 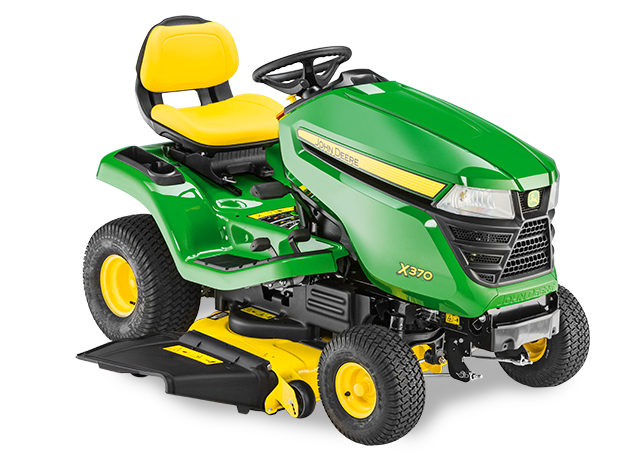 The X380 has all the Select Series features with their Accel Deep mower deck and a larger 48-in. or 54-in. 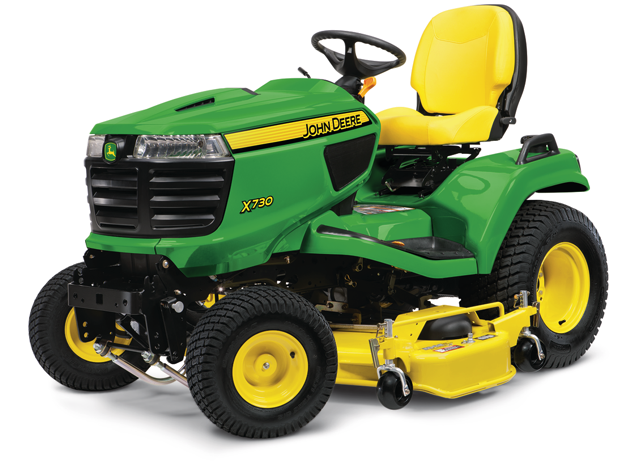 cutting systems,and add the 22-hp V-twin John Deere iTorque Power system provides excellent power and performance, easy starting and smooth running. All the above features of the X380 but with the added maneuverability of 4 wheel steering. 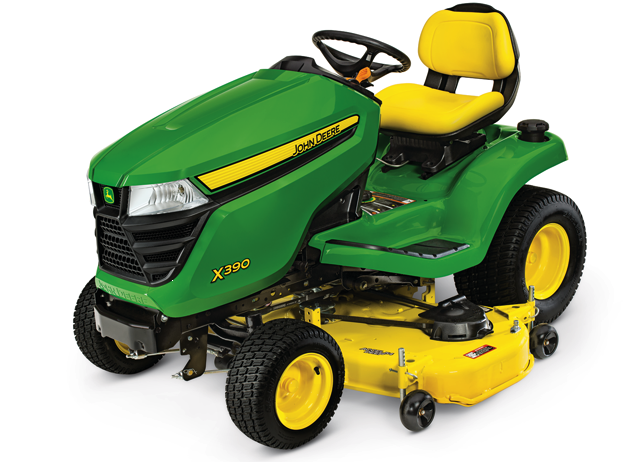 The X390 Select series Lawn Tractor is a premium product at an attractive price. 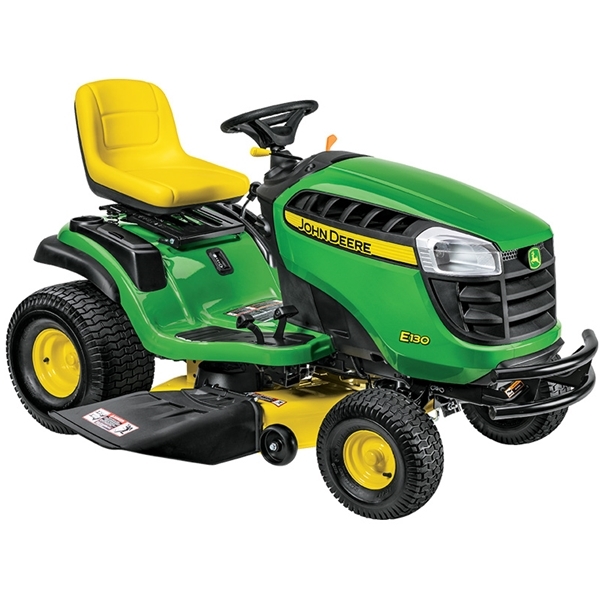 Features include power steering with a tilt steering wheel for exceptional maneuverability and comfort, as well as hydraulic lift for superior convenience and ease of use and an option of 48-inch or 54-inch Accel Deep Mower decks. All the above features of the X390 but with the added manueverability of 4 wheel steering. The X570 Multi-Terrain Tractor has a powerful iTorque Power System, easy to use twin touch hydrostatic transmission and convenient foot pedal lift system that is easier for most people to use than competitive hand lift systems. 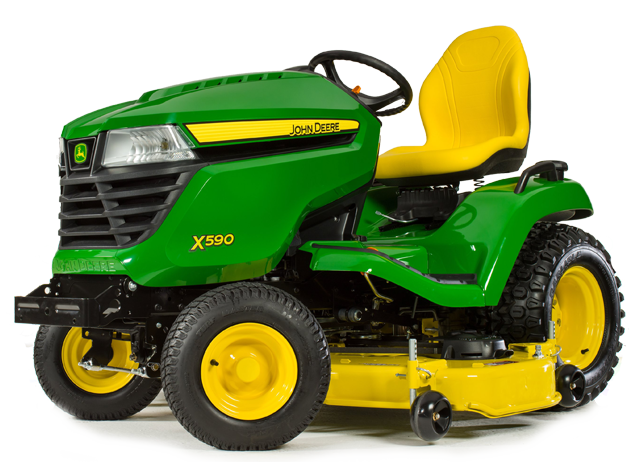 The X580 Multi-Terrain Tractor comes with a powerful iTorque power system, easy to use twin touch hydrostatic transmission and the conveniance of hydraulic lift, power steering and a a 54-inch Accel Deep Mower deck. 48 inch or 54 inch..
Hydrostatic Twin Touch pedals with cruise control. The X590 Tractor has a powerful electronic fuel injected (EFI) engine with constant speed governor for quick starts and superior performance, With deck options from 48 - 54-inch. Edge Xtra cutting system with heavy duty all purpose (HDAP) rear tyres. 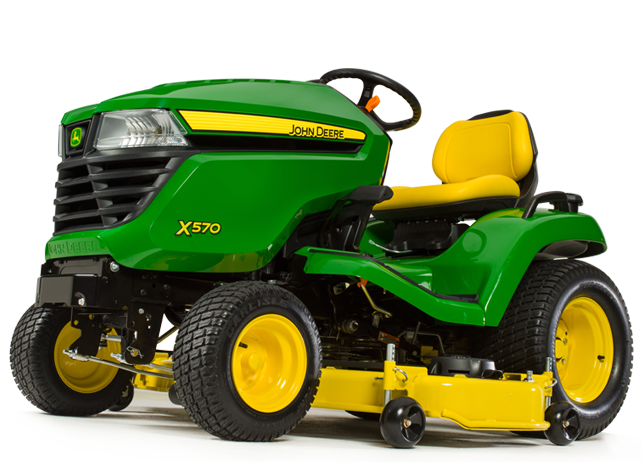 Select™ Series X700 Ultimate riding mowers and lawn tractors are designed and built heavy-duty to meet the needs of both property owners and commercial users. These X700's are heavy-duty, versatile machines, capable of mowing and landscaping large properties, with challenging terrain. The X730 has a liquid cooled iTorque power system that provides plenty of power to operate a 48-in,54-in or 62-in. Edge Xtra mower deck and also a wide variety of additional yard care equipment. The X734 Signature Series Tractor has a liquid cooled V-twin iTorue Power System for superior performance for mowing and doing a wide range of other tasks.The X734 has four wheel steering for superior trimming capability and maneuverabilty.Electronic fuel injection (EFI), a premium feature that adds power and ensures fast starts and smooth warm-ups.Two wheel drive with a standard differential lock, can efficiently handle a variety of tasks. The X738 Signature Series tractor has a liquid cooled iTorque Power System for superior performance for mowing and doing a wide range of other tasks. The X738 has full time four-wheel drive to handle rougher terrain and power thru tough ground engaging jobs, while maintaining a tight turning radius for excellent maneuverabilty. The X739 Signature Series Tractor has full time four-wheel drive and four-wheel steering to handle rougher terrain and power thu tough ground engaging jobs. Electronic fuel injection (EFI) adds power and ensures fast starts and smooth warm ups. The X750 has a powerful 24-hp diesel engine that provides plenty of power to operate a 48-in. through to 62-in. 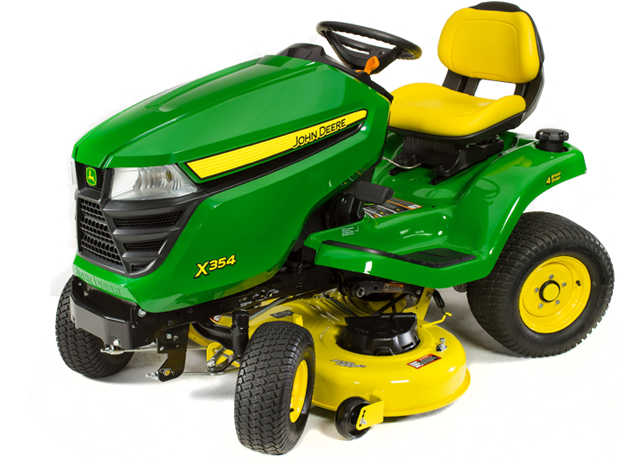 Edge Xtra Mower decks and a variety of additional yard care equipment. The X754 Signature Series Tractor has a liquid cooled iTorque three cylinder diesel engine for extra torque and durability. It has four wheel steering for superior trimmimg capability and maneuverability. Two wheel drive with standard differential lock, can efficiently handle a variety of yard care tasks. The X754 Signature Series Tractor has a liquid cooled iTorque three cylinder diesel engine for extra torque and durability. 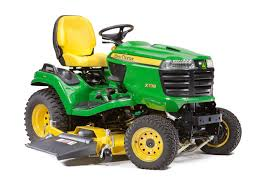 It has four wheel steering for superior trimmimg capability and maneuverability. Full-time four wheel drive to handle rougher terrain and power thru tough ground engaging jobs, while maintaining a tight turning radius for excellent maneuverability. 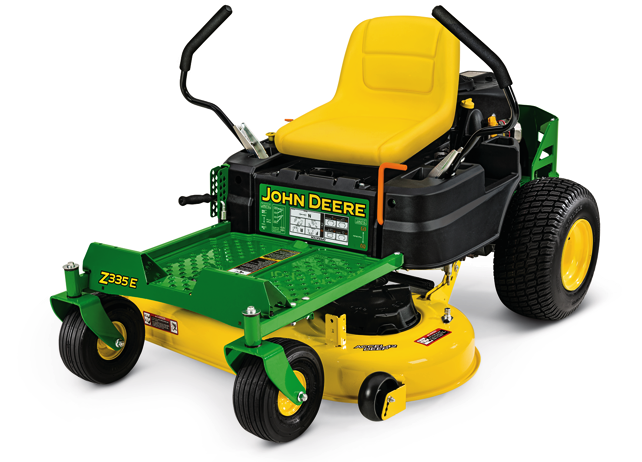 The Z335E EZTrak Residential Zero Turn Radius mower offer unmatched quality, performance and comfort. 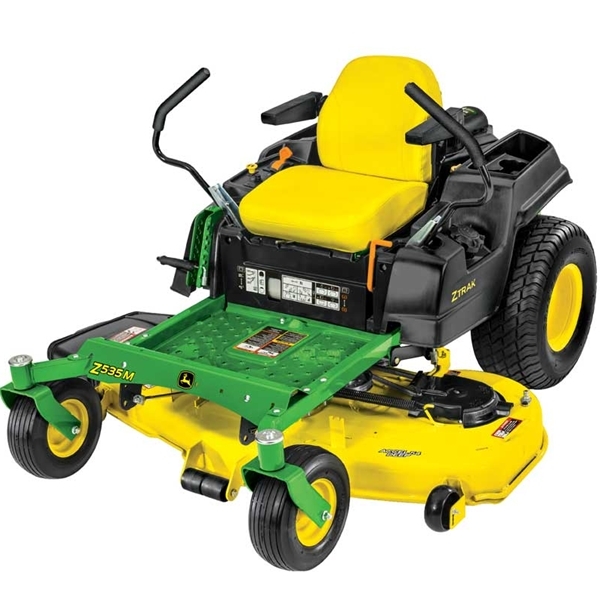 It is designed for use by residential customers looking for an efficient mowing machine with exceptional maneuverability and trimming capability. The Z345R EZTrak Residential Zero Turn Radius mower offer unmatched quality, performance and comfort with upgraded features. 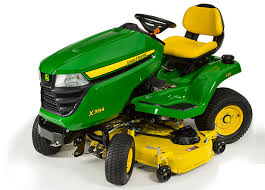 It is designed for use by residential customers looking for an efficient mowing machine with exceptional maneuverability and improved comfort. 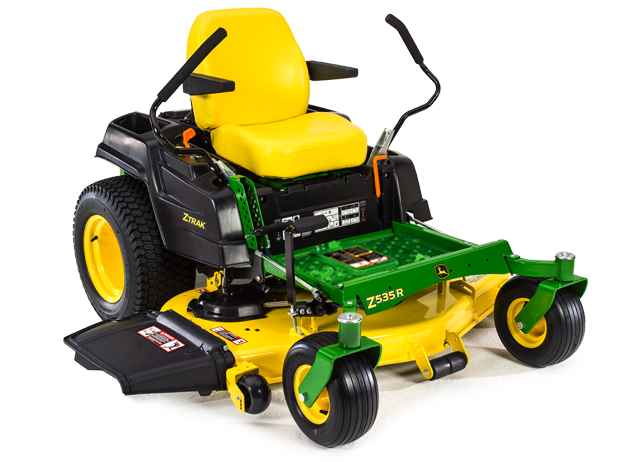 The Z355E EZTrak Residential Zero Turn Radius mower offer unmatched quality, performance and comfort. 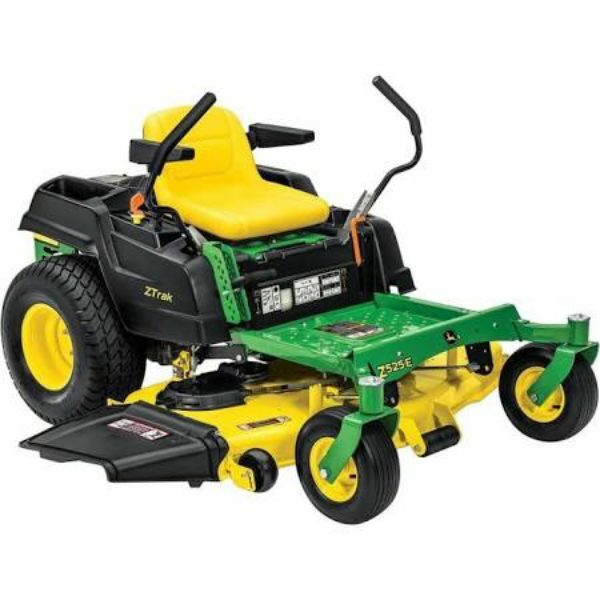 It is designed for use by residential customers looking for an efficient mowing machine with exceptional maneuverability and trimming capability.With the extra wide 48-in. Edge cutting system it gives you the flexability to Side discharge, mulch or collect with a 230L rear bagger. The Z525E offers unmatched quality, performance and comfort. Along with exceptional maneuverability and trimming capability the Z525E is equipped with the new Accel Deep mower deck that can handle side discharge, mulch or collect with a 6.5-bu rear bagger. 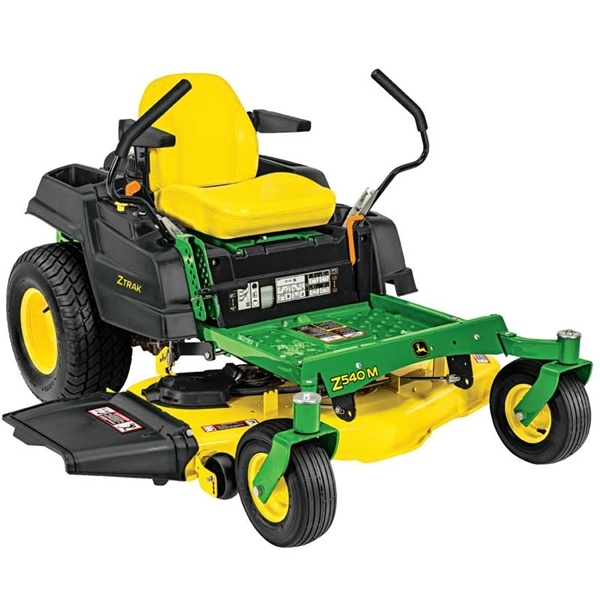 The Accel Deep Mower Deck has a single piece stamped steel shell specially shaped to maximize airflow for optimal cut quality, especially at faster speeds. The Z525E offers unmatched quality, performance and comfort. Along with exceptional manueverabilty and trimming capability the Z525E is equipped with the new Accel Deep mower deck that can handle side discharge, mulch or collect with a 6.5-bu rear bagger. 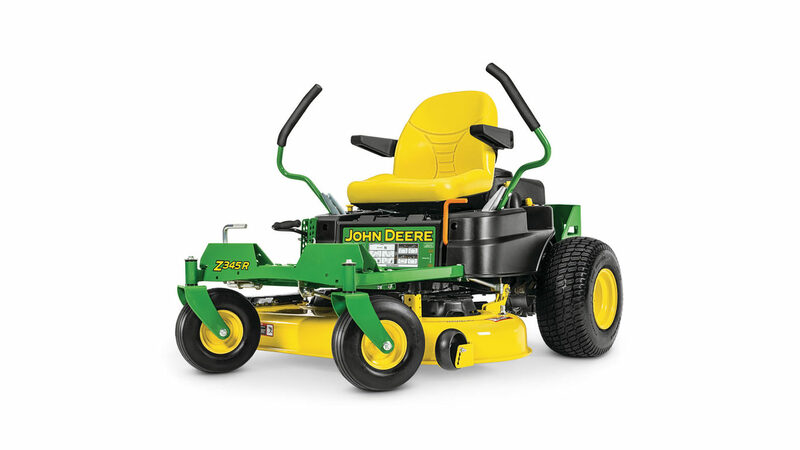 The Accel Deep Mower Deck has a single piece stamped steel shell specially shaped to maximize airflow for optimal cut quality, especially at faster speeds. The Z540M offers quality, performance and comfort. 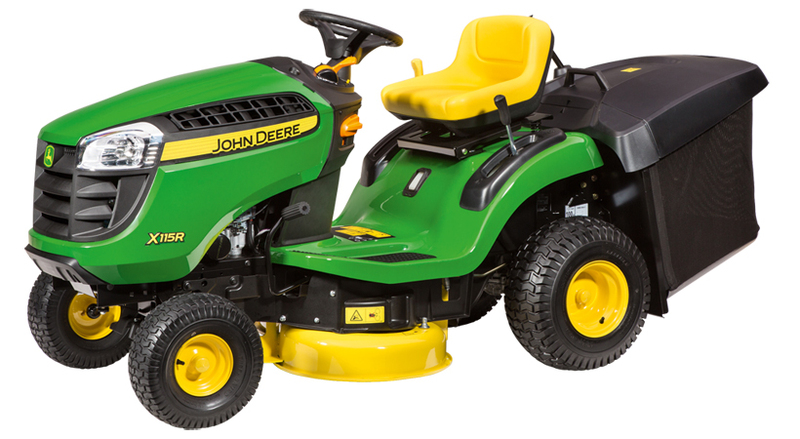 Along with exceptional manoeuvrability and trimming capability this mower is designed to efficiently tackle a wide variety of mowing jobs. The Z540M is equipped with a 122 cm (48 in.) Accel Deep Mowing Deck that can side discharge, mulch or collect with a material collection system. The ZTrak Z535M has a 724-cc, 25hp (18.6 kw) cyclonic engine that provides plenty of power and torque to handle the toughest mulching, mowing & bagging conditions. The cyclonic air management system removes larger particles of dirt before they reach the air filter for reduced filter maintenance and longer engine life. 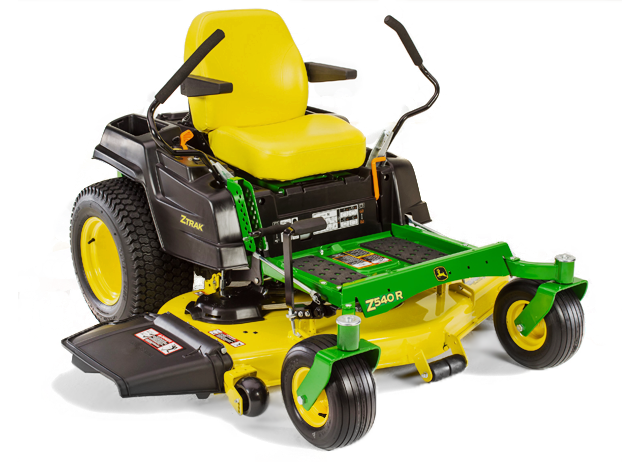 The Z535R has a 724cc, 25 hp (18.6kw) cyclonic engine that provides plenty of power and torque to handle the toughest mulching, mowing and bagging conditions. The cyclonic engine is specifically designed for zero turn mowers and includes a five step intergrated cyclonic air management system. This cyclonic air managemnet system removes larger particles of dirt before they reach the air filter for reduced filter maintenance and longer engine life. The Z540R offers quality, performance and comfort, along with exceptional manoeuvrability and trimming capability. 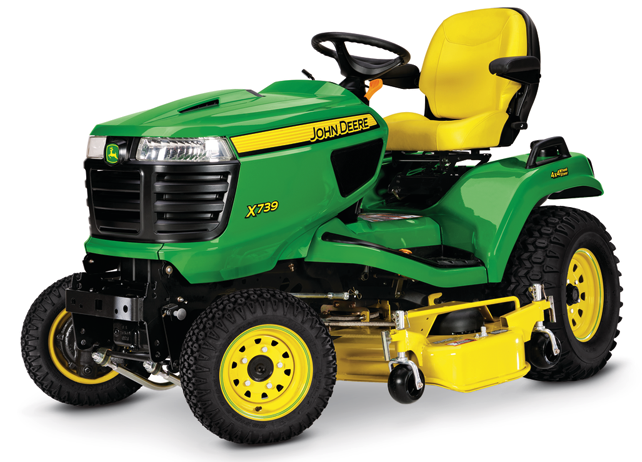 This mower is designed to efficiently tackle a wide variety of mowing jobs. The 48-inch deck is stamped from heavy 9-gauge. 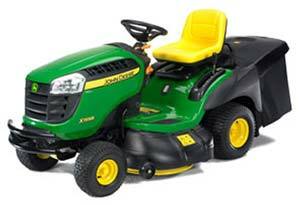 3.8mm steel for durability and has a deep deck design to handle larger volumes of grass. 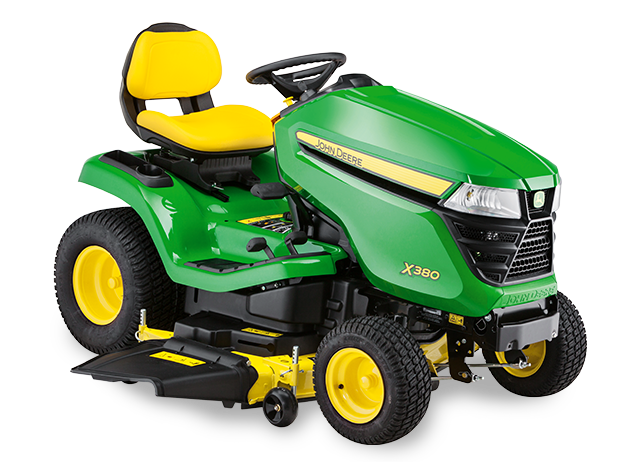 The Z540R's heavy duty frame, larger tyres and convenient controls provide reliability and an enjoyable mowing experience.